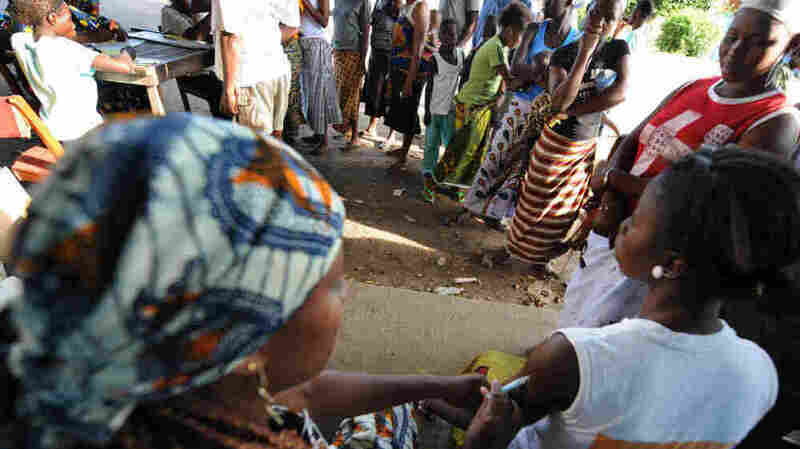 GAVI To Make HPV Vaccine Available In Developing Countries : Shots - Health News About 88 percent of cervical cancer deaths occur in developing countries. The deaths can be prevented by an HPV vaccine, which will be available to some women for the first time in 2012. Women in developing countries, such as Cote D'Ivoire, may soon have access to vaccines against HPV and rubella. Women in developing countries will soon have access to vaccines for human papillomavirus and rubella, the GAVI Alliance announced today. HPV causes about 275,000 cervical cancer deaths each year, and 88 percent of those deaths occur in developing countries. GAVI says the vaccine is critical for women and girls living in these areas because they don't have access to screenings for cervical cancer. "Vaccination is a life or death issue for these people," Rhonda Stewart, spokesperson for GAVI, tells Shots. The announcement is just the latest in a string of recent commitments from Gavi to distribute vaccines for children in developing countries. The organization is a partnership of governments, donor agencies, the vaccine industry and philanthropists. Negotiations to secure an affordable price for the three-shot HPV vaccine began in June when Merck pledged to make doses available at $5 a pop. But GAVI says the price needs to be even lower. In the U.S., it costs at least $300 for a full dose. "Given the threat, it needs to be affordable to help as many women as possible," Stewart says. Beginning in 2012, countries will be invited to apply for the vaccine. As part of the application, they'll have to demonstrate that they can actually get it out to people and that they can let people know it's available. To help get over cultural hurdles, GAVI has partnered with civil society groups in various countries to help get the word out about the benefits of the vaccine. By 2015, GAVI expects that 2 million girls in nine countries will have received the HPV vaccine. It won't be available to boys unless the World Health Organization recommends that. The rubella vaccine, also part of the roll-out, will be combined with the measles vaccine into a single measles-rubella shot, GAVI says.